Congress passed a new NASA authorization bill this week,just in time for the space agency's birthday tomorrow (Oct. 1). But the spaceagency's anniversary finds a NASA in the middle of shifting gears to embrace anew exploration regime. The bill, approved by the House last night (Sept. 29), authorizesNASA to embark on a new direction outlined by President Obama, and toabandon old plans laid out by the Bush administration to return astronauts tothe moon by 2020. Instead, NASA will now aim to send explorers to an asteroidby 2025 and Mars in the 2030s. Tomorrow marks the 52ndanniversary of the day NASA officially opened its doors to begin the headytask of sending people into space and exploring the universe. Having a clearer picture of where the agency is heading,thanks to the newly passed bill, is exactly what NASA leaders were hoping foras a birthday present, NASA's deputy chief Lori Garver said. The U.S. space agency is still in for a rough transition. 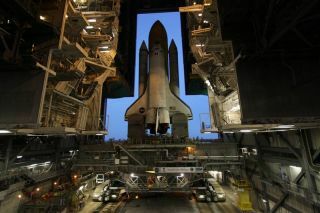 This anniversary is coming as NASA winds down its spaceshuttle program, which has been the national standard bearer for humanspaceflight for the past 30 years. Two more shuttle missions are scheduled? ? witha third one just approved with the new bill ? before the three-orbiter fleetretires for good. With the end of that program, scores of jobs at NASA and itscontractors will be lost. In fact, tomorrow (Oct. 1) nearly 1,400 shuttleworkers will be laid off at NASA contractor United Space Alliance ? a jointventure by Boeing and Lockheed Martin. Today (Oct. 30), NASA contractor Lockheed Martin, whichbuilt the 15-story external fuel tanks for the shuttle fleet, announced that ithas finished its tank production duties after 37 years. Lockheed Martin built the huge orange fuel tanks at theMichoud Assembly Facility in New Orleans. The facility employed 1,438 at thestart of 2010. Today, only 600 remain, Lockheed officials said. "It is clearly an agency in transition," saidformer astronaut Leroy Chiao, who served on the independent AugustineCommission that helped shape ?Obama'snew space plan. "Transition is the difficult time, especially for thepeople who are losing their jobs? But I am optimistic that what will emerge isa stronger, more robust program and agency, once the transition is workedthrough." The new path also lays the groundwork for a strongerpartnership between NASA and commercial space companies, with funding put in placeby the bill to encourage development of private spacecraft that can ferryastronauts to and from the International Space Station once the shuttle isgone. These kind of changes will likely shape the future ofAmerican spaceflight for decades to come, some space program experts said. "I think NASA is kind of at a crossroads, and that'sobvious," said Roger Launius, space history curator at the Smithsonian'sNational Air and Space Museum. "The decisions that are made here ? there'sa lot riding on this. It's going to govern human spaceflight for the next 25 to30 years, probably." NASA's illustrious past ? especially its achievement ofbeing the first and still only program to put people onthe moon ? does set a high bar for the future to live up to, space industry expertssaid. "As we look at what we've accomplished in the first 52 years,it does make it a little daunting," Garver said. "I don?t thinkthere's any question that NASA beating the Russians to the moon and sort ofestablishing during this Cold War race the U.S. as a superpower in a peacefulway, is the pinnacle achievement. I guess my view is it was really only thebeginning." The moon shot of Apollo 11 in July 1969 influenced a wholegeneration of people, especially many who ended up joining NASA. "When Apollo11 landed on the moon, I was eight years old," Chiao wrote in ane-mail. "That event inspired me to dream of becoming an astronaut myself,and inspired a whole generation of young people to achieve. Not one of uswould have thought that we would not have gone to Mars by this point, back inthose days." Instead, NASA is looking toward a near future without theability to launch humans to space after the end of the space shuttle era.During that time, the United States will be dependent on the Russians for spacetransport, until an American commercial alternative is available. "However, I see this as a blip, and am optimistic thatwe will re-emerge as the leader in human spaceflight, albeit a few years downthe road," Chiao said. Chiao said he hoped privatespaceships would be available soon to take over the responsibility ofcarrying astronauts to low-Earth orbit. In that case, NASA could focus ondeep-space exploration. Launius agreed, and said he hoped that the next 52 yearswould see exciting missions to new destinations. "I'm not getting any younger and I'd like to see us gosomeplace before I'm gone," he said. Garver said she was confident that can be accomplished inthe next half century. "As we explore with humans and robots beyond low-Earthorbit, the destinations include for sure the asteroid mission the president hasspecifically outlined for 2025," she said. "I think 52 years is atime when, as we develop these capabilities, we'll be able to go to the moreinteresting destinations."